This was painted as cover art for Corporate Mentality by Steven Piziks (Baen Books 1999), sequel to In the Company of Mind. 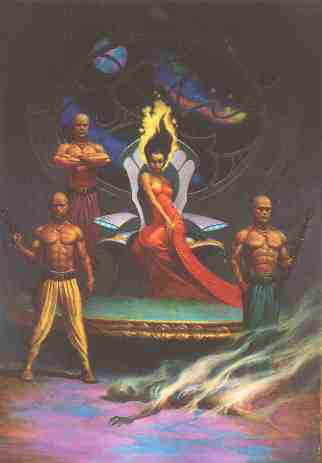 It portrays the main character of the book not as others see her, but as she sees herself. 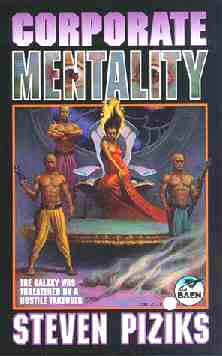 This was one of Charles' first science fiction book covers, created for In the Company of Mind by Steven Piziks (Baen Books 1998). Having read and enjoyed the manuscript, the design process for this painting was a balance of creating an intriguing image without giving away the story. 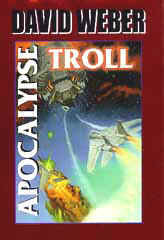 In 1998 Baen honored Charles with his first commission for a hardback book: The Apocalypse Troll by David Weber (1998 Baen Books). 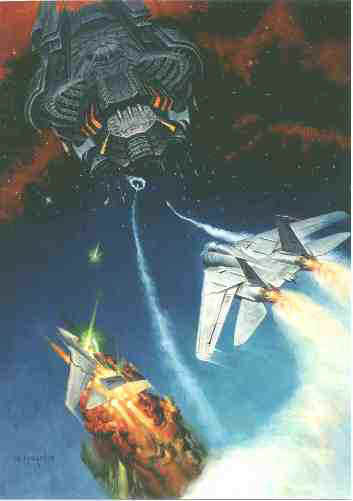 Lots of research went into this painting to ensure that the Navy jets were just right.